Mojácar is a very popular tourist resort with great beaches on the Costa Almeria coast. There are two distinctly different parts which are 2 km apart – Mojácar Playa is the modern beach resort and Mojácar Pueblo is the original village perched up higher on the foothills of the Sierra Cabrera. The yellow bus service is very good and there is an hourly bus service between Mojácar Playa and Mojácar Pueblo, public transport in the town and area is good for Spain. Whichever part you intend to visit we have it covered below. We cover famous sights, what to see and where best to go. One crazy rumour you will often see is that Walt Disney is reputed to have been born here, then his family moved to America and changed his name. Hmmm! The one American connection that is a true fact, is that the nearby Tabernas desert has a theme park called Mini Hollywood and the desert has been the film set location for many famous westerns such as Clint Eastwood’s ‘A Fistful of Dollars’ amongst others. Most visitors or holidaymakers will be coming to the 17 km long beach area which stretches all the way south to the Cabo de Gata National Park where the resort of Carboneras is located. Just north is the smaller and much quieter beach resort of Garrucha famous for it’s large red prawns and fishing harbour. We must warn you that the Costa Almeria region is one of the driest in Europe, in parts it is desert. Of course this makes for a very hot and reliable climate with little rainfall – perfect for holidaymakers seeking guaranteed sun – but boy is it hot in July and August! For average temperatures and what to wear and bring see our detailed weather page. Luckily if does not rain much because there isn’t much to do although there is the ten-pin bowling lanes underneath the Pueblo Indalo hotel/apartments. Mojácar’s busiest beaches are Playa del Cantel and Playa de la Cueva del Lobo but elsewhere there are plenty of small coves where you can sunbathe in relative privacy. Other beaches include: Las Granatillas Beach, El Sombrerico Beach, Castillo de Macenas Beach, Cueva del Lobo Beach, El Cantal Beach, El Descargador Beach, La Murina Beach and the Marina de la Torre Beach. To be honest there are much better beaches in Spain – try the Costa Blanca region for some of the best. Mojacar sand is pretty dry and dusty and not very golden in colour. Still the beaches are awarded at least three Blue European Flag Awards for cleanliness and good facilities. If you want watersports you have plenty, you can choose from boat trips, scuba diving, snorkelling, windsurfing, fishing and sailing. For lots of fun try not falling off the banana boat ride! For the sporty you can even do horse riding and trekking into the hills as well as mountain biking. The favoured beach bar (chiringuito) is Tito’s beach bar at the southern end of the beach. Mojácar has a decent nightlife scene with plenty of bars such as Saabs and a few nightclubs such as Mandela Beach, Maui, Moma, Liquid, and Zen. For sights make sure you see the defensive fortress from the 18th century known as the Macenas Tower which acts as the gateway separating the main beach area from the beaches reserved for naturalism (nudists). Below we have a tourist video of Mojácar showing all the best sights and attractions. To also see the resort in real-time i.e. right now – see our Mojacar webcams page. The Torre Bahia is a traditional Spanish restaurant which we love. Sure there are lots of restaurants offering international food, especially to the large British market but you should venture out of your comfort zone a little while on holiday and try the local food, especially freshly caught fish from the Mediterranean. Mojácar really is an international resort offering Chinese, Indian, Mexican and French food. The Beachcomber Restaurant is also highly regarded. From first glance it doesn’t look like anything special but the food really is of excellent quality and at reasonable prices too. Very family-friendly and run by John with friendly staff and service. Restaurant El Cortège at the Bar La Pirate is a nice Italian restaurant. To be honest for our review, we have to be slightly critical and say the course wasn’t kept in the best condition and other golf courses in the local area would be preferred. The green fees were quite high too considering the course is a bit dull and lacks challenge with wide fairways and short rough. St Andrews this is not! Other courses nearby – inland just off the A7 autoroute are the Poligono Campo de Golf Valle Este Golf Resort and also the Cortijo Grande Golf Resort. The nearest airport is Almeria airport to the south (about 80 km and an hours drive) as you can see on this map of Mojacar and the Costa Almeria. Some distance north (150 km) is Murcia airport with a two-hour transfer time and Alicante airport is a two hours and forty-five minutes drive. So how do you get to Mojácar and what is the cheapest option? Certainly the easiest option is to jump in a taxi cab immediately outside Almeria airport. The taxi fare would be €85 and from Murcia Airport around €170. Note that these fares are one-way. There are buses to Mojácar from the city of Almeria and you can get from the airport to Almeria city easily enough. Shuttle bus transfers are comparable to taxis but usually cheaper because you may have to share with other passengers also going to Mojácar. With a company such as advanced.shuttledirect.com you can expect to pay £145 for a family of four during the month of July from Almeria Airport to Mojácar and £365 for a family of four from Murcia Airport during the same period. More than most towns in Costa Almeria, Mojácar has attracted a large expatriate population with many British and Irish full-time residents. The town has a cosmopolitan feel to it which helps attract even more people. This originated back to the 1960’s when Mojácar attracted artists and writers in the hippy era. The two separate areas has helped attract so many expats because you have the lovely beaches with plenty of nightlife options in nightclubs, bars and pubs but equally if you want to get away from it all, the traditional Spanish village (the Pueblo) is only 2km away so you get the best of both worlds which is unusual. We welcome any stories you may have to share if you are now living in Mojácar as we have a whole section devoted to moving to Spain. Elaine, what would you say would be the advantages to living in Mojácar compared to other Costa Almeria towns? Perhaps the first thing that many people will think of when they consider Mojácar is the weather. It is true that with its very own micro-climate the area undoubtedly has the best weather in all of Spain. There is very little rainfall and lots of sunshine although the wind can be strong at times. According to the experts the area enjoys over 3000 hours of sunshine every year. It’s easy to lose count after the first 1000! The winters are virtually non-existent which makes the area an ideal all year round destination. Many people spend the winters here in Mojácar only returning to their homelands during the very hot summers. Then there is the absence of the high-rise building so the unspoilt landscapes provide you with a pleasing vista. The low rise buildings and the long stretch of coastline (approx. 17 kilometers) give a relaxed village feel to the town yet it fulfills all of the requirements of everyday modern living. Mojácar is the kind of place that embraces people from all walks of life and cultures and these people mix and mingle enjoying their surroundings oblivious of class or profession. Mojácar is an area of outstanding beauty with a beckoning finger and visitors always return. Mojácar is an area that appeals to all types of people; the young, the elderly, singles and families. It has a very nice feel with a good community spirit and is the sort of place where families feel safe making it an ideal holiday location. The young and the older seem to mix well. Mojácar is a holiday resort so the summer months are packed full of activity and with plenty going on there is something for everyone. The winter months bring a welcome break from the hustle and bustle of the much needed tourist trade, however, with this the amount of activities dwindles. This is fine for families with young children and those working and living here, but keeping teenagers occupied during the winter months can be challenging. 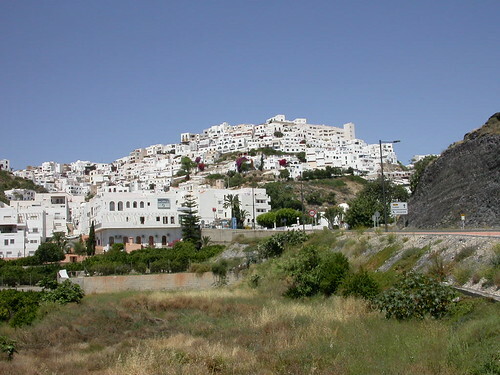 Mojácar has a population of around 6000 and of those we would estimate about two thirds of the population to be Spanish. There is also a large population of Brits, Belgians, French, Germans, Americans, Latin Americans, Moroccans, Chinese, and Rumanians. In fact, most other countries are represented here; there is truly a cosmopolitan flavour to Mojácar. There is so much to do and see in the area, where to start. This year saw an extension to the promenade with the inclusion of a cycle lane and seating areas and this has become a popular area for tourists. Aside from the lovely beaches and swimming we have great selection of beach bars and restaurants. Trip Advisor recommends trying the Fuente publica to join the locals in collecting their water and to admire the architecture and no visit would be complete without a trip to the old town of Mojácar with its Plazas and narrow winding streets. You can also try scuba diving, bowling, or horse riding. Also worth a visit are the caves of Sorbas and the natural park “Cabo de Gata” (on the sea) and Cazorla (with forests and deer). Then we have the more commonly known towns like Sevilla, Cordoba and Valencia, all within striking distance of Mojácar. Further afield but a must to visit are the cities of Barcelona, Madrid and Granada. With an excellent motorway system these places are easily attainable. Mojácar has a great selection of restaurants, bars and beach bars and there is something for all tastes, styles and budgets. Standards are generally high in the area so you will not be disappointed. If you fancy Italian you could try the Ostería (find them on Facebook) and there are many traditional Spanish restaurants, Indian restaurants, French restaurants, and more. A particular favourite for calamari and paella is Hola Ola, on the beachside it has a great atmosphere and is popular with the locals and holidaymakers (find them on Facebook). Overall the facilities within the area are good. There are municipal and private doctors’ surgeries and a host of alternative medicine practitioners in Mojácar and the surrounding area. There is also a very high quality of dental care available with several to choose from. The shops are very varied and more than adequate for day to day living to suit all budgets and tastes. The hospital at Huercal Overa is just 40 minutes from Mojácar and is known to be one of the very best. The nearest shopping mall is the Mediterranean in Almeria about 50 minutes drive from Mojácar, open from 10 a.m. to 10 p.m. daily, except Sunday. There are some lovely villages in the surrounding areas and what follows is just a small selection. Bedar – is a wonderfully authentic Spanish village nestling in the lower slopes of the Filabres Mountains. It has a good selection of amenities and some excellent restaurants in particular El Mirador. Garrucha – is a lively working fishing town with excellent dining, a lovely promenade and safe bathing beaches. In recent years it has become a popular tourist destination in its own right earning the slogan “Garrucha, Sun and Seafood”. The town is famous for its large red prawns, fished only in local waters. Carboneras – meaning coaling or coal bunkers marks the start of the Gabo de Gato Natural Park. The area, now stripped of coal has changed the landscape which now contrasts beautifully with the deep blue of the sea. The area now relies on fishing and tourism and recently established itself as an industrial centre producing energy and cement. Lorca – is a great town to wander around with its traditional “high street” and shopping centre. You cannot visit Lorca without going to the caste, a fortress of medieval origin constructed between the 9th and 15th centuries. Cabrera – is a hilltop village on the edge of the Sierra Cabrera and about 10 kilometers from the coast of Mojacár. Magnificent views are guaranteed from its elevated position and the sunsets are unsurpassed. The architecture is impressive and draws on the Moorish influence, with courtyards, archways, domes and filigree arches, all painted a terracotta colour a perfect companion to the landscape. Vera – Originally called Baria, this renaissance town is among the most important commercial centres in the area. The main square, Plaza Mayor, has many buildings of interest and significance, for example the Church de la Encarnación built circa 1520 to protect against the frequent Moorish attacks. Not for all tastes, but built in 1879 the Plaza de Toros (Bullring) is a much newer construction. Vera is a flourishing town providing and selling local goods from the huge range of shops or the famous Saturday market, which quite simply takes over the town. A good selection of quality bars and restaurants complete the picture. The nearest international schools are in Murcia and Roquetas and the only private school in the area is Valdeserra in Vera. Valdeserra takes pupils from nursery to college age and has an excellent reputation for its rounded and extensive curriculum. I don’t think that it is a concern for expats. While there is no such thing as a crime free town, Mojácar feels like a safe place to live and to holiday. Most of the crime that occurs is opportunistic. Price Brown celebrated 30 years in Mojácar in June 2016 and has been successfully selling properties throughout that time, during the highs and the lows. Much has been written about the downturn that occurred in 2008 however, much to the combined relief of all who work in this business, 2015 brought with it an increase in the number of people purchasing a property in the area. Benefiting from some of the problems in other countries the love affair with Spain was re-ignited. While prices were not rising greatly, the gap between the asking and selling price was certainly closing. As well as the increase in the numbers of people wanting to purchase, their budgets were also increasing. Despite Brexit we remain confident that 2016 will end on a high! This is a great time to purchase a property and with the likelihood that prices will increase, there is small window of opportunity in which to benefit from the low prices. The so called “cheap” properties have not existed in Mojacár for some time now and Mojacár has fared better than most during the down years. There are a number of repossessions available but just because they are repossessions doesn’t make them value for money. So buyers do your homework. Surprisingly, Mojácar has in excess of 140 urbanisations. Some are small with just a handful of properties; some larger with tennis courts and swimming pools. As a rule of thumb, however, urbanizations North of the Parque Comercial Centre, in a quieter location tend to attract people living here permanently. While Urbanisations South of the parquet Comercial Centre, closer to the bars and restaurants, are more attractive to the holiday maker. How much are the typical property prices in Mojacár for apartments, villas etc? Typically for a 2 bed apartment on a community with a shared pool you would be looking to spend an average 125,000 euros. For a 3 bed prices start from around 150,000 euros. Mojácar is striking for its uniqueness when it comes to villas so an average price is difficult to say. However, prices would start around 300,000 euros. Any tips and advice to people looking to buy in Mojácar or surrounding area? Mojácar is a great place to buy a property; you have the beach, the shops, bars and restaurants. Before buying a property think about your own lifestyle and what you see yourself doing on a daily basis. Do you want to be able to walk to a restaurant or to the beach, are you happy to get the car out every day; do you want peace and tranquility or night life or a bit of both. Think about the location carefully and speak to the locals. Then, once you have decided to purchase a property work with a good Estate Agent and an independent Solicitor. You can’t go wrong. Address: Ctra. De Nijar, Km 9. 04130, Almeria. This is the closest airport to the Mojácar area being only 80 kilometers from the village taking the A7 motorway route. There are excellent motorway links to this airport, several opened only in the last few years, one of which is a toll road that cuts the driving time to the airport from Mojácar to about an hour. This is the largest of the 3 airports serving Mojácar and surrounding area, but also the furthest away, about a two and a half hour trip without stops. It does, however, have a good, direct, route but care is needed the first time you make the journey when you get to the Murcia area as several motorways converge and diverge. All three airports have national and international flights, both scheduled and chartered. Elaine, thank you so much for taking the time to help our readers with your experiences in Spain. If you want to contact her, you can find her details below. The Los Atalayones apartments come highly recommended and are centrally located. Going self-catering in private apartments rented direct by the owners is usually the cheapest way of staying in Mojácar. Not for everyone’s taste but for really cheap how about the hostel Arco Plaza superbly located in the heart of the old town and from just €35 a night. If you have no budget the best hotel is probably the four-star Parador de Mojácar Hotel right on the beach. El Arbela is a good one but if you are a typical Brit abroad and you want your familiar foods and brands then go to Mr UK. The best supermarket in Mojácar surely has to be Spanish chain Mercadona. Good selection and value prices. This is the original village which has been unspoilt by the modern developments and urbanisations that have sprung up in other parts of Mojácar. It is worth visiting just for the amazing views of the coast and the Sierra Cabrera mountains. The best views are from the highest point – the castle (Mirador Castillo). Set up high on the hillside the pueblo has narrow, cobbled streets with whitewashed houses many of which have flowers hanging down. It is described as quaint and pretty by tourists. The centre of the village is the square of Plaza Nueva. A famous sight is the La Fuente Mora (Moorish Fountain) which has been a source of natural spring water for many centuries and a place where locals came to wash their clothes. The fountain is also called the Fuente de los Doce Caños (fountain of the dozen spouts). There are remains of the influences from the Phoenician, Carthaginian and Roman occupations but the Moors have influenced the town the most as seen in the city gate (Puerta de la Almedina) which has a coat of arms dating from the 15th century and the 14th century church of Santa Maria, converted from a Moorish fortress. 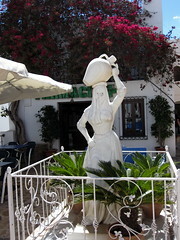 In front of the Santa Maria church is the Mojaquera statue, this is a woman wearing a traditional Arabic head-covering dress and carrying a water container. For restaurants – try the Antler. The big fiesta (festival) in Mojácar is the ‘Moors and Christians’ held each June, this celebrates the fall of Moorish Mojácar to the Christians. Expect colourful parades, lots of fireworks, extravagant historical costumes and mock battles. For further help try the official Mojácar tourist office which provides all sorts of help and advice. They can help with finding accommodation, tourist information, what is on in Mojácar, what to see and do as well as a range of brochures and free maps. Address: Plaza Nueva, Calle Glorieta, 1, 04638 Mojácar Almería. Telephone: +34 950 47 51 62. Market day is a Wednesday (near the town hall in Mojacar Pueblo). Plenty of local fruit and vegetables and handicrafts. Many people also have recommended Garrucha market on a Friday. This is the symbol of Mojácar (of an Indalo man with outstretched arms holding a arc) and you will see this in postcards and painted on many of the buildings. Said to bring good luck and protection from evil spirits, this dates back 4,500 years old. The symbol depicts the Neolithic painting found in the caves of Letreros in Velez Blanco. The arc is supposed to have magical powers. Page Summary – This page contains unique content about the beach resort of Mojacar, a popular tourist destination on the Costa Almeria coast of Spain. For a drink or a bite to eat in a relaxed atmosphere and spotless surroundings the best bar on Mojacar playa is ‘KUKIS’ bar. friendly host who speaks about 5 languages, he always makes you welcome in his bar.